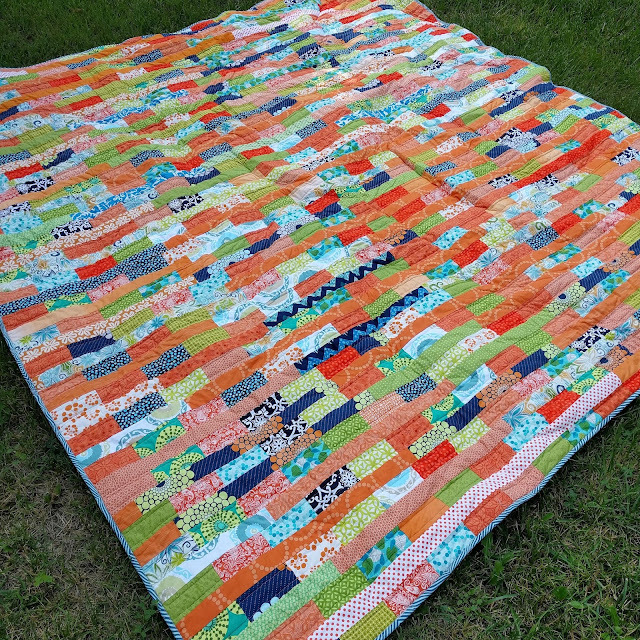 For the Love of Orange : A Finished Quilt, FINALLY! 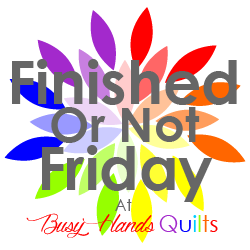 I try to not have too many projects just laying around in an unfinished state, but sometimes life gets in the way and well other times I have quilter's ADD and want to start a new project before I have finished my last project. Well that is exactly what happened with this quilt. I started cutting out this quilt in March 2014, just after I really started to get into quilting. I finally started piecing it together in June 2014, but never finished, since I started working on my handmade gifts for the Christmas. 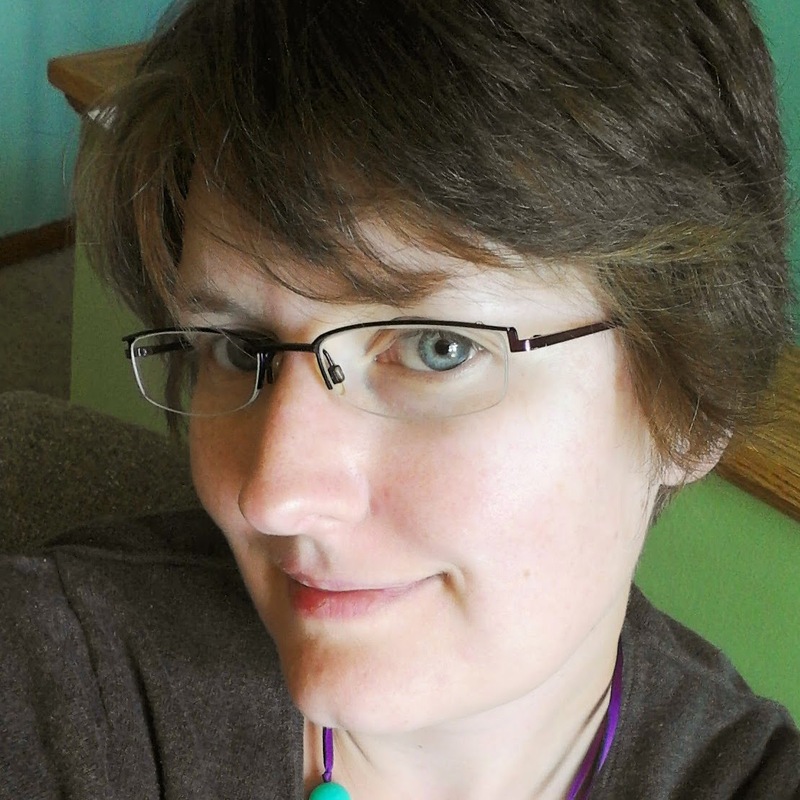 Plus I found out I was expecting baby number 2 during this time and all of my sewing energy was zapped. Well needless to say I finally finished piecing the top together in January 2015 so I could get the strips off the crib for a baby that was going to be arriving soon. I had decided that I didn't want to bast or try and quilt this beast when I was 8 months pregnant, so I stashed in my WiP pile and began on other projects. I originally planned on finishing this quilt before the end of 2015, yeah that didn't happen, then I added it to my 2016 Q1 List for the Finish A Long and it still didn't happen. But this June I finally pulled it out and quilted it up, since it was my project for Stitched Studio's CEO Club. Without that I think this quilt would still be in my pile. It was a bit of a beast to quilt, but I managed. I decided to keep the quilting simple with straight-ish lines and it worked beautifully for this quilt. My arms were defiantly getting a work out while quilting this bugger. 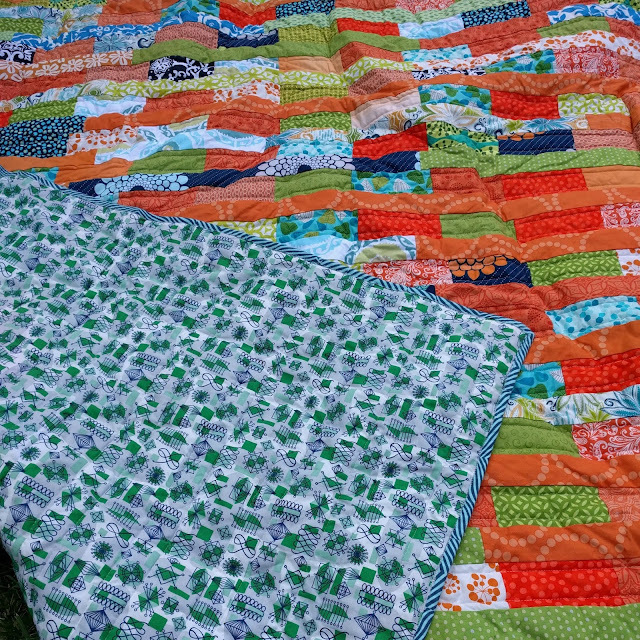 I do love how it turned out, which is good since I'm not planning another queen size bed quilt for awhile! It is so nice to finally be able to snuggle with one of my quilts at night. 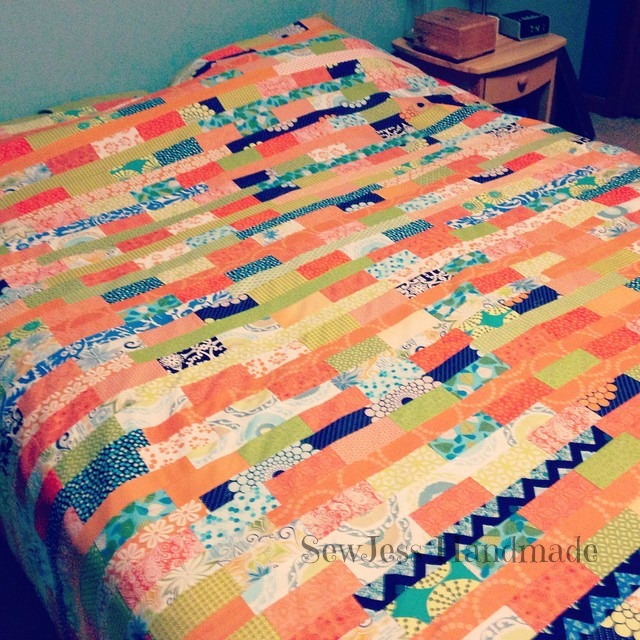 I love that this quilt is no longer in my WiP pile, but on my bed where it belongs! Now onto other quilts!!! 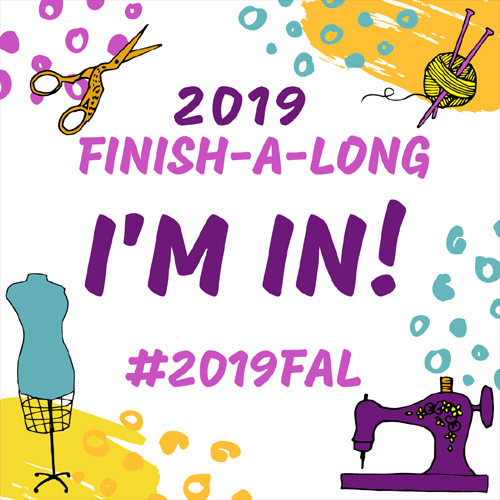 Fabric: Various designers including Lizzy House, Amy Butler, and many many more. 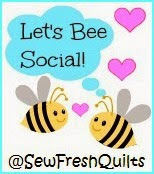 Linking up with Lorna for Let's Bee Social at Sew Fresh Quilts, and Amanda for Finish it up Friday at Crazy Mom Quilts. Jessica I love how this turned out. As a new quilter I see this in my future, once I build up a stash of fabric. What machine are you using? I'm in the market for a new machine. I have a Husqvarna Viking Opal 650. 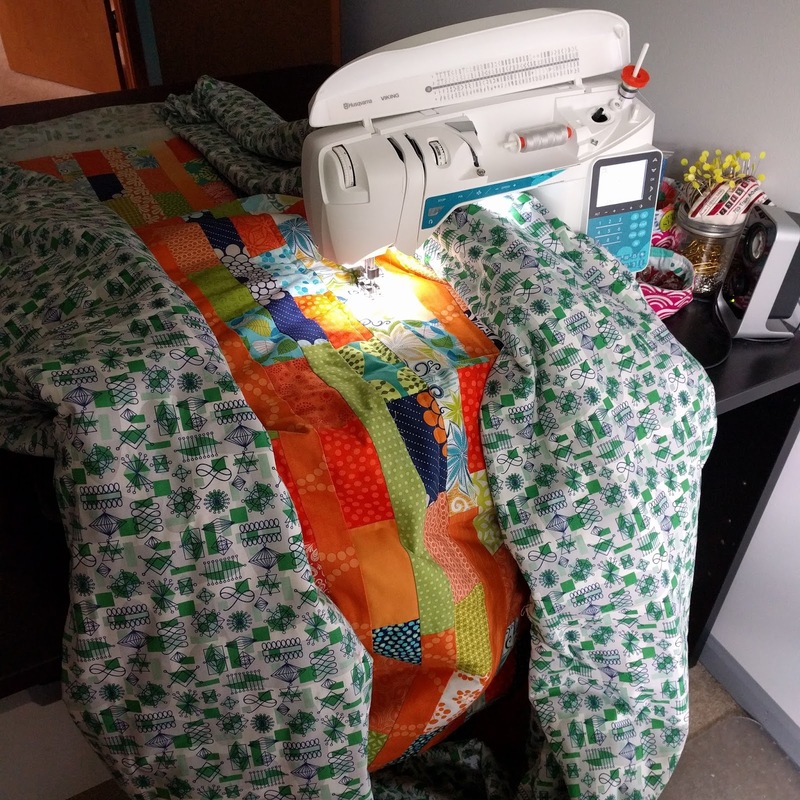 I've had her for almost 3 years and I love her, sews and quilts beautifully. That turned out wonderfully! I love the colors. Those large quilts can be really difficult to quilt. Well done! Thanks, I'm glad it is finally. Now I can enjoy it on my bed. Really nice! Large quilts can challenge us all, but you've conquered the beast. They are a challenge, but one I'm glad I took. Just might be awhile before I attempt another large bed quilt. 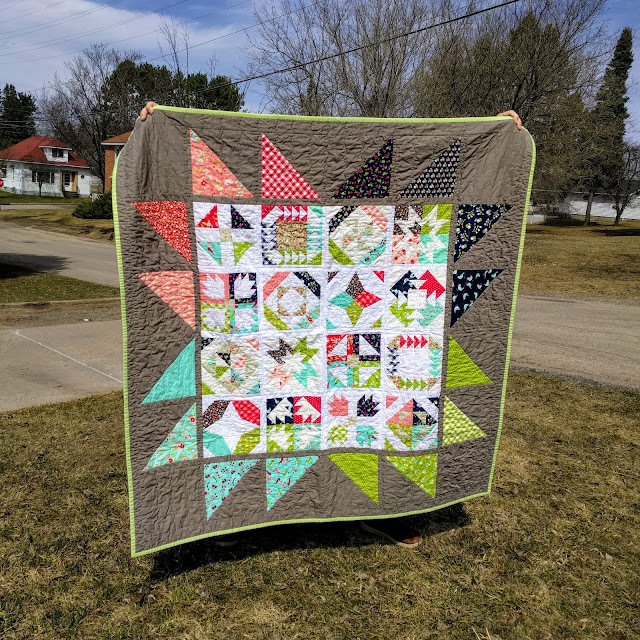 Awesome quilt, great scrappy pattern! Lovely colours on this quilt.